Millennials (and everyone else, for that matter), step away from your smartphones. With consumers spending more and more time tethered to their phones and other devices, a former director of digital strategy for GoGo Squeez has launched Folk Rebellion, a new brand and mission to encourage people to take a time-out from their technology. Folk Rebellion -- which founder and “chief rebel” Jess Davis says she hopes will turn into a movement -- was inspired by her own experience working in the world of social media and marketing, which had sapped her creativity, memory and focus. After a self-imposed tech-free vacation, Davis returned to her home in New York refreshed, and realized she wasn’t the only one who might be feeling ill effects from constant connection. The new brand, which launched in December, is using social media channels (primarily Instagram) and a Web site to get the message out. Davis acknowledges the irony, but says, "to reach as many people as possible, I have to reach them where they are." Interrupting people’s social media feeds is also a way to provide continual reminders to unplug and be more mindful of their technology use. While tech-free retreats can be helpful, it’s too easy to fall into old patterns upon return, Davis says. 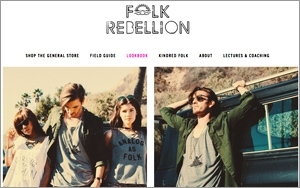 The current goal of Folk Rebellion is to drive traffic to the brand’s Web site (www.folkrebellion.com), which provides content and other ideas about mindful technology use, as well as selling products (such as T-shirts and nostalgic products like records) through an e-commerce store. A portion of the proceeds will be donated to the Children & Nature Network. “We’re going to introduce new concepts and products throughout the year, things that are going to change technology usage and bring [people] back to real life,” Davis says.